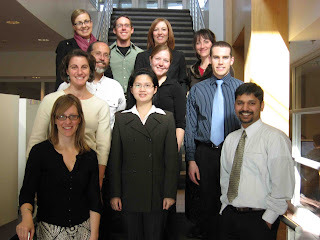 Here are the 2008-09 TA Scholars posing just outside their poster session last week at the Academic Senate meeting. We had an amazing group of people this year! You can learn about their projects on the TA Scholars website.They've done some innovative things like implementing virtual labs in traditional classes, creating peer mentorship programs, comparing online and face-to-face teaching, and assessing the effectiveness of an entire program of study. I am so grateful to have worked with this bright, creative, fun bunch of graduate students! 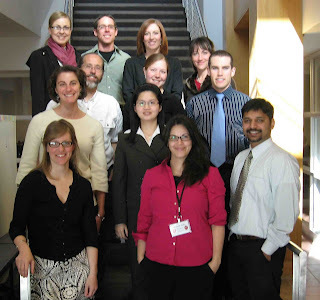 If you or someone you know is a graduate student at the U and would like to become involved with the TA Scholars program, please email me at beverly.brehl@utah.edu.